Mr Myles, here is my money. Take it. but do they leave your corpse smelling like lemons?. So, sour... they blow your face off! Why don't you sell these things. Come on. My monies, you may take them all. 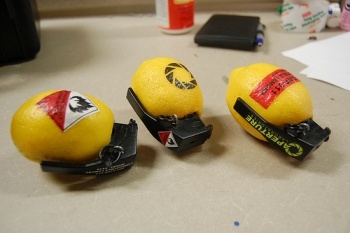 Just give me those lemons!!! "The Arbiter would likes some Lemon Grenades!" I didn't think the joke made a very good meme, but this is just plain awesome! When I read Lemon Grenade all I could think of was a scene from Unforgotten Realms. Quite agreed. I want this so bad! HANDS OFF, IT IS MINE!!!!! Explosive lemonade for the win. Don't forget the talking turrets. Oh yeh, them too. Hell, with an arsenal like this at my disposal, I'd be invincible! About time. That's about the best thing I've heard all day. ...This man is my new hero. I think we found a new meme. I wonder, if any bank will give me the necessary credit to buy, (captcha: Atomic okleforl) uhhh...... enough. Burning peoples houses down, with lemons! this man is doing what were all thinking! "When life gives you lemons, make life take the lemons back!"